On my first married Easter on the farm, I helped deliver calf number 428. It was chaotic. I was only in the yard to remind my newly married spouse that time was ticking and that we had to be driving to my parent’s house in Cork. I wouldn’t ask it now. Come on. But remember, I was new to this and he was still trying to break me in. So I arrived in the farmyard in my flowery wellies trying to move him on when I heard a lot of mooing; three cows were calving. Himself was helping two cows out in the calving house, one of whom was having difficulty calving (the vet would have to be called) and another who needed some assistance. One nervous heifer (first time mother let’s say) was nervously backing out of a paddock not knowing what was happening to her (in labour). To ease her worry, I, of all people, stepped in, she who had never seen a cow calf before, to help calm the lady down. I shu-shu-shushed her, cajoled her to calm down with my ‘there-theres’ until eventually she settled herself down in a feeding passage (portion in front of the main sheds where silage is placed for the cows to eat) to calf. Not the perfect location let’s say. When the vet arrived for the cow in the shed, the scene was chaotic, with the two in the shed in trouble, one in the feeding passage in labour, not to mention the new wife in flowery wellies practically singing to the calving heifer. I remember the poor vet asking Dan bewildered if ‘all was alright?’ not quite sure of the scene he had come upon. To be honest, my lady would have calved away by herself but being enthusiastic and fully sure that this new husband of mine could not manage without his new Jane Eyre, I stood behind the cow as she calved. He had given a few instructions. When the crew beans (calf’s hooves) appear and I was sure the calf was coming out the right way, I could help ease the calf out with the cow’s breath. I felt it; and if truth be told, it helped me when it came to my turn in the labour ward. With each exhalation, she pushed her calf further along it’s journey out. I would wait for her to exhale and then pull on the crew beans to help ease her burden. With a breath, a nose appeared, and she’d breathe again; a nose. Eyes, closed. Ears. Shoulders and then slide, the release into the world. She delivered calf number 428. She was the first little calf I ever helped to deliver. There was so many that Spring and in my quest to impress himself, I spent a lot of time in those days, feeding calves, preparing bedding, cajoling newborns to drink their milk. I remember 428 as a healthy calf. In the years that followed I continued to know her as she was a bit of a pet. They normally don’t but she was one of those who would come over to you for a bit of a rub. If I was hanging out the washing and the cows were grazing in the field behind the house, she would always come over to me. It’s as if she knew. So Thursday, I got the text. He was selling cows and would I get the cards ready (each cow had a passport that goes with them when they go for sale at the mart)? Her number appeared. There in the list of numbers was number 428. Honestly, the same day was crazy busy. It didn’t have a lot of time to register with me. There was Christmas tree to sort, kids stuff to attend to, I had to milk the cows (me, yes!) so I put it to the back of my mind. Before I knew it, she had left the yard. I can only say that she lived well here. Knowing him, she had always been treated well, ate in fine pasture, sauntered into milk each day for us. But it doesn’t make it easy when a cow leaves the farm. The difference is now though is that I’m not that girl in flowery wellies ‘playing at farming’ anymore. I’m all grown up. Farming is our family business and is our life here. Just like my hands that are no longer soft, I know that we give our animals a good life in return for their produce and then when lameness or old age threatens them, when they don’t go in calf or when their milk supply goes down, it’s their time to leave the herd. No matter what their number. It’s hard. I’m sad both for 428 and for the girl in flowery wellies who watched her coming into the world. When I finish this post, the thought will be put to bed as I get on with the next chore of the evening. You know, if you’ve read along this while (and I thank you), then you’ll know that I love farming but it really can be a very hard life. This entry was posted in City Girl, family life, Farmhouse, Farming Outlook, Uncategorized and tagged cows, difficulty, farming on December 9, 2016 by annebennettbrosnan. I’m stuffed from cold chips. It’s that kind of a day. You grab meals while you run between the two smallest boys who want a drive on one of the five tractors bringing in silage outside the door and the kitchen where you run getting the tea ready. By now, I can time it well enough. They have another five acres to collect, the sky is holding, so the silage men will eat before they cover the pit. I’ve got a half an hour. It was an early start. As always, we were in a rush around the farmhouse, our usual tardy selves catching up with the day. I put the bacon onto boil while I made the scones; a dozen brown, a dozen fruit. With the oven still hot, I put the bacon now smeared with honey, mustard and cloves into bake and it’s scent wafts into every corner of the house. I lay the table and have to run to town. I never know when the crew are to eat until closer to the time so I have the food ready to go. Scones covered, ham cooling, salads ready. All the way home from town the boys ask if the tractors have arrived. I’m not sure. Maybe. Probably. Every five minutes or maybe less, the same answer. Soon. Probably. Maybe. We’ll see. And then as we drive along our road, we can see the big machines in the silage fields sucking up the grass like a straw in a green field with their forage harvesters. To placate the boys who just want to go to Daddy, I set two chairs up in the field so they can watch the trailers emptying their loads of grass onto the pit and see the awe-inspiring packer climb over the grass even-ing it off expertly. I know it would take my boys in wellies about five minutes to get to the gate so I run between them and the kitchen. With the tractors parked up in the yard, I can switch on the oven and fill the kettle all the time running between the children and the oven. All plates were eaten whilst watching an Irish athlete go for gold at the Olympics. He broke an Irish record as we all watched on drinking the tea and eating the ham, satisfied. No rest for the wicked, the pit has to be covered, the children have to watch on and I have the ware to wash. The cow’s feed saved for the winter. I might just flick that kettle on again before the running starts again. Second cut silage saved. This entry was posted in family life, Farmhouse, Farming Outlook, Uncategorized and tagged children, farming, feeding, second cut silage on August 18, 2016 by annebennettbrosnan. Jumping out of bed at 6am, I got the kids lunches’ ready, ran around a la crazy lady, blew kisses in their general direction and drove out the drive. Packed lunch and serious wellies in the boot, I was ready for a day at farming college. Or so I thought, for the only thing that wasn’t in the boot was the spare tyre that I had taken out at the weekend to make room for a very glamourous hatbox and a particularly classy umbrella for a cousin’s wedding (and a few other bits beside). So to my dismay when I heard the clang, clank, wop of the tyre bursting thirty minutes into my journey, I wasn’t feeling particularly clever or ready to become a farmer. No, my friends, I was feeling like a bit of a girl. A big girl foolish to be precise. At this point, I must apologise to my fellow women, my sisters as it were for the following retelling of yesterday’s day at farming college. It was not my intention at the outset to let down the female population by being such a girl when faced with the mechanic and farming tasks that were put before me. But there was a wedding, a day’s teaching and three small boys to knock the masculine out of me before. And while I didn’t quite mention the lovely post wedding nails that for the first time in my life I hadn’t managed to chip, I put in an SOS or SON (save my nails) phonecall into my farmer to come and a).bring the tyre and b). change said tyre. I know, girls, you’re rolling those eyes. For it was just as well, my hero came for not one person stopped to help out this damsel in distress as she was stood in a lonely country road staring confusedly at a wheel jack. So now sweaty, tired and late, how I hate to be late, I arrived at farming college with dirty hands (I did try!) trying to catch up as the tutor explained the differences between the different breeds of bulls before us. Bull. Oh dear. They didn’t quite look the same but at this point, I don’t know if I quite cared enough. ‘Enough of this theory business, now to the heifers’ he said. ‘You’ll have to separate this giddy heifer,’ he said to me. To me! ‘No Sir, you don’t quite understand, normally himself does the separating (takes one animal out of the herd), I just stand back and stop them.’ I, the lady on the farm, normally stands in the gap as do a lot of farmer’s wife in the country, it’s a part of the job description. At this point may I also point out that there are a great number of very successful real farmers that are women but I am most certainly not one of them. Yet. No excuses taken, into the ring of heifers with me. I didn’t quite ask the giddy heifer if she would like to leave the shed but I wasn’t far off. I could see from the corner of my eye that the tutor and fellow students were quite amused but was determined not to let myself down (I hear ya sista!). Eventually with some coaxing and polite tapping, I managed to get the unhappy girl out of the shed with two of her companions. The object of the task was to place them in an adjoining pen and I just about succeeded. A mucky job. But it didn’t stop there. For before I even got a whiff of a cup of coffee, I had to dose and inject a cow, take her temperature (I’ll leave that to your own imaginations) among other similarly unfamiliar tasks that would not generally take this farmer’s wife from her kitchen. Having quickly eaten a lunch afterwards, we were back in the sheds estimating a cows weight, weighing her, separating calves for mart, assessing their price and for the piece de resistance dehorning some calves. The tagging (tagging calves’ ears with their number, think ear piercing) I just about managed. I thought that would be useful to help the farmer out next spring but the dehorning just about brought me down. I must add by this stage in the day, the men in the group who had grown up dosing and dehorning animals were very encouraging and helped us girls (for luckily I wasn’t alone) all the way. Fit to drop later that afternoon our tutor informed us there was just one more task as he put us fixing up a temporary fence. Enough already. Was there no end to this day? Look, most importantly, there are now a great many more tasks that I can help my farmer with. In fact my day led to a very animated conversation over dinner about cattle conditions and the price of poly heifers. Who knew? I think, you know, that this industry could just about do with some female intuition and know-how just about now and why, there is always a bit of room for a touch more glamour. N’est ce pas? This entry was posted in Uncategorized and tagged countryside, farmer's wife, farming, household, tagging on June 22, 2016 by annebennettbrosnan. So I cleared the breakfast ware earlier than usual this Saturday morning to make room for my bouquet of grasses. I was standing on the road herding the cows into the parlour yard for the farmer, I have my uses, when I saw along the hedgerow a meadow of grasses. It’s that time of year, we’ve had heat, sun and now moisture and the hedges are bursting with colour. 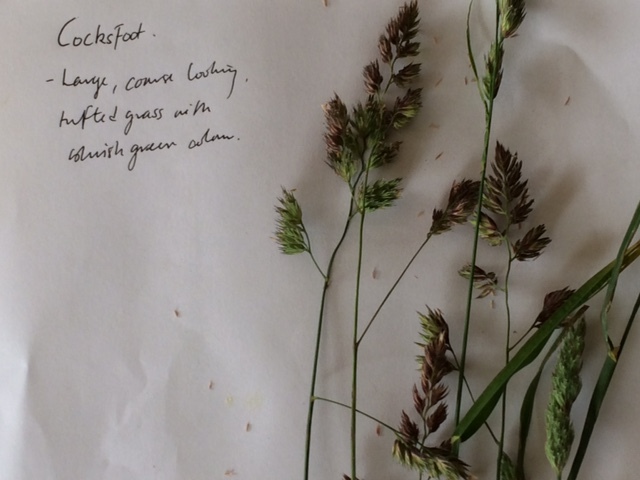 I was a woman with a one track mind, not the cuckoo flower or daisy for me today, no, I was collecting grasses. winter food for the cows. Why, the clover is even fixates nitrogen, essential for growth of the sward. I know, I don’t recognize myself. Who is this knowledgable lady? Ta-dah. So where does that leave our lovely meadow. Well outside the grazing paddock, out to pasture. In the farm’s memory, you could nearly see another farmer spreading a seed-drill of cocksfoot, annual meadow grass or scutch to name but a few. And here we are grazing our cows on ryegrass, perhaps whispering a hello to great grand children. Wouldn’t that be grand? So this amateur botanist is away now to clear away the table for the next meal that may or may not include men cutting our grass for silage. It depends I suppose on whether or not this passing shower will turn into rain all day. Such a precarious business this grass growing. A bouquet of grass for you Madame/Monsieur. 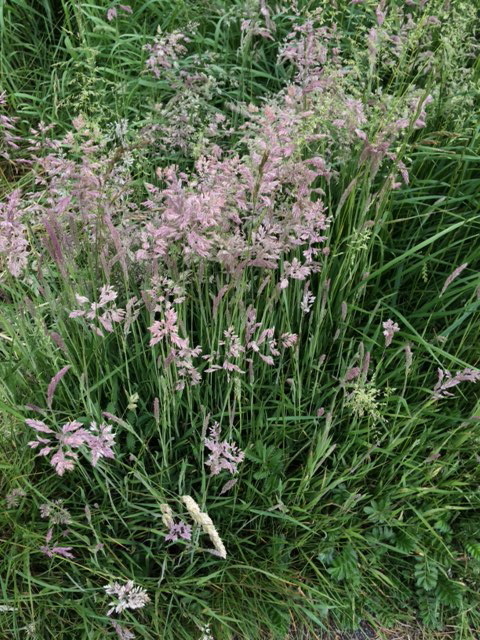 This entry was posted in family life, Farmhouse, Farming Outlook, Outings, The Living is Easy, Uncategorized and tagged botany, farming, grass on June 11, 2016 by annebennettbrosnan. She thought she knew it all. Had this farming business down. She was wrong. You might have noticed my absence over these months. I haven’t been away. Still here throwing a shape as they say on a farmhouse in North Kerry. However, to add an extra dimension to the household, I have returned to college (on a very part time basis) to study agriculture. Yes, I’ll say it again, he did see me coming. Studying for ‘The Green Cert’ has benefits for our farm and our plans for the future but what I wasn’t expecting was the fact of how little knowledge of farming I actually had and whats more this new venture in learning was a step into the virtual unknown. Indeed. I had mentioned to a couple of friends that I was thinking of doing it. The city friends, knowing me, laughed. Did she ever see herself studying farming, didn’t she avoid farmers around campus for fear of ending up anywhere other than a swanky European capital without a filofax or shoe budget to her name (ah the notions of a twenty something language graduate, bless). The country friends, both male and female, have looked at me in awe, telling me their own stories of farming college, the year they ‘gave in Pallaskenry’ and said ‘Fair dues,’ smiling all the while at the poor misfortunate that didn’t really know what she was getting herself into. The first few visits to college have been tragic. Examinations not going well (something as a top student, ahem, I was utterly unprepared for), and the dawning realization that not having grown up on a farm or not having really been listening to my husband talk about the farm (yes dear, spreading in the High Field, I hear you, should I take in the washing? ), I am swimming up the proverbial slurry pool without a paddle. Pooooh- eee. I mean did you know there were different types of Grass? Nor did I! I thought it was classified by colour; green, greener, greenish, yellow tipped, dark green, oh, that’s green. Forty shades what? No apparently, it’s all Perennial Ryegrass this, Scutch Grass that, Cocksfoot, Timothy, Yorkshire, Meadow Fescue to name but a few. And I think my girlish charms are not going to get me out of this one. (Not that I batted my eyelashes and said Green when asked, no, no!) And they’re going to test me on this. Really! I kid you not. Stand in front of this grass and identify them they’ll say. Identify them? Trust me, they are very similar. Please note (though you may have it figured), if you’re a botanist, this is most definitely not the blog for you. Turning this around, I see this new phase in my educational life as a opportunity. One that I hope to share with you, if you want to listen that is. Climbing up the next step on the agricultural ladder as I leave the flowery wellies behind for a brand new pair of the more serious Dunlops. If nothing else, farming prepares you for a life of overcoming the odds, all the while with the good farmer by my side, explaining as I go along. You know, I might just learn to wade well through that river of slurry, emerging as a newer and better version of myself. Stranger things have happened, like they’ve labelled grass! Yours, Girl in Serious Wellies, version 2.0. This entry was posted in family life, Farmhouse, Farming Outlook, Uncategorized and tagged agricultural, education, farming on April 24, 2016 by annebennettbrosnan.